I'm not the daintiest gal on the block, but I love a feminine style that's not too girly. This dress seemed to strike that perfect balance. The pattern and material made it quite delicate looking but the slim fit and off the shoulder style gave it a more sleek look that appealed to me. And I am loving dresses with belts because I find I can move them up to be an empire waist while pregnant and then back down to normal once I'm not. Best of both worlds! Also, I should mention that this dress is also a petite gal's dream because I am 5'4" and it hits me at the most perfect length for flats, heels, wedges, etc. Speaking of wedges, these are still going strong for me as a gorgeous summer classic piece (last seen in this post). The heel height is comfortable for all day wear and the color is the most gorgeous neutral. 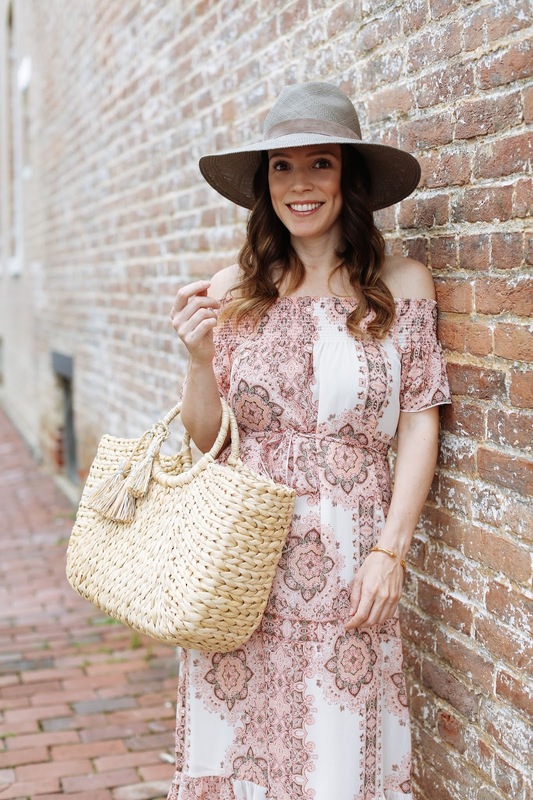 They do come in a ton of other colors but if you want a standard espadrille that will work itself seamlessly into most wardrobes, this is definitely the color and style to get. Stay tuned for part II of my Nordstrom Anniversary Sale Haul because I had a few more items trickle in and will be putting up a video either late tonight or very early tomorrow morning!